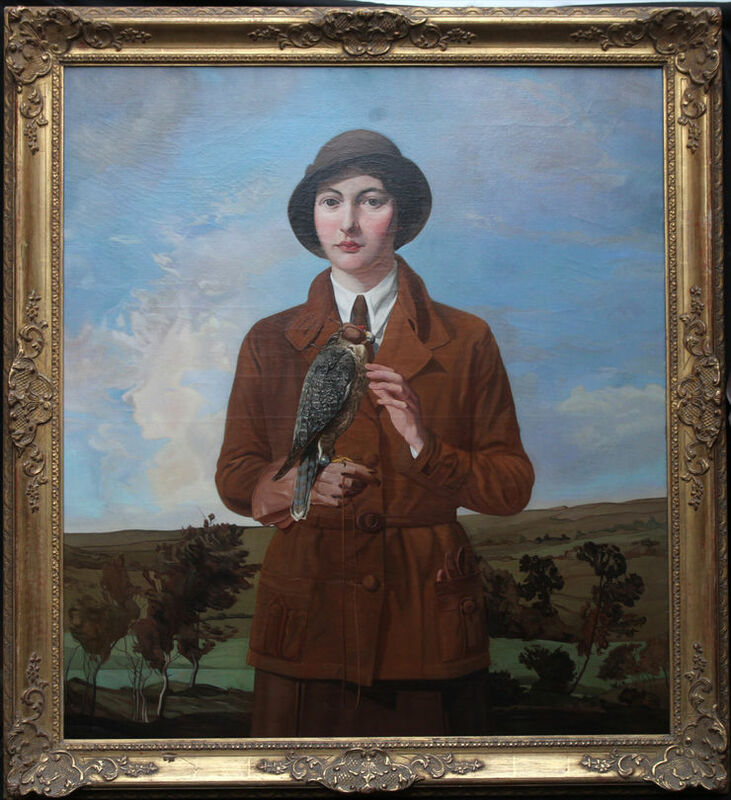 A large, stunning three-quarter length Art Deco portrait by Exley, of a young woman in green holding a falcon. The woman is Mary Exley, wife of the artist. 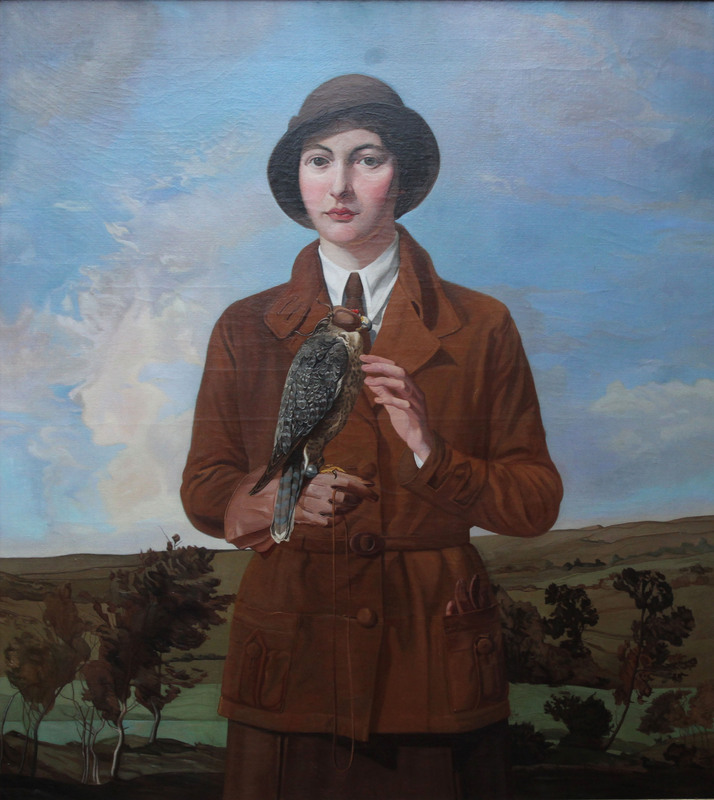 The portrait was painted circa 1936 and has been exhibited numerous times, including at the pre World War II exhibition Britain at Play in 1939 and The Royal Academy in 1936. The title is The Young Falconer. A beautiful inter war 20th century portrait of a young woman. It is in excellent condition.This is a striking painting by a noted British listed artist and is a fine example of an early 20th century portrait painting. Signed right. Private family collecton. The Royal Academy 1939. Number 499. The Art Exhibition Bureau. Britian at Play 1939 Exhibition. City of Bradford Artists Exhibition 1951. Fine gilt frame 50 inches by 40 inches approx. Good condition. Exley was a painter, printmaker and teacher, born in Great Horton, Bradford, Yorkshire on 16th May 1878. He studied at Skipton Science & Art Schools and at the Royal College of Art, graduating in 1907. He then went to work in Paris for a time. He was headmaster of Hull Municipal Art School, 1912-1919 and also taught in Cambridge, moving to London in the 1920s. Exley exhibited widely from 1906 and became a member of the Royal Society of Painter-Etchers and Engravers in 1923. Exley was elected ARE in 1905 and RE (Fellow of the Royal Society of Painter-Etchers and Engravers) in 1923, exhibiting at the Royal Academy, Redfern Gallery and Royal Glasgow Institute of the Fine Arts. He subsequently lived in Grassington, Yorkshire.